I was the mom of one sweet newborn baby and 3 other adorable, active children under the age of 7 when my husband came home one fall day and announced that he had military orders and we’d be moving. Which meant we had less than 5 months to complete our home sale. 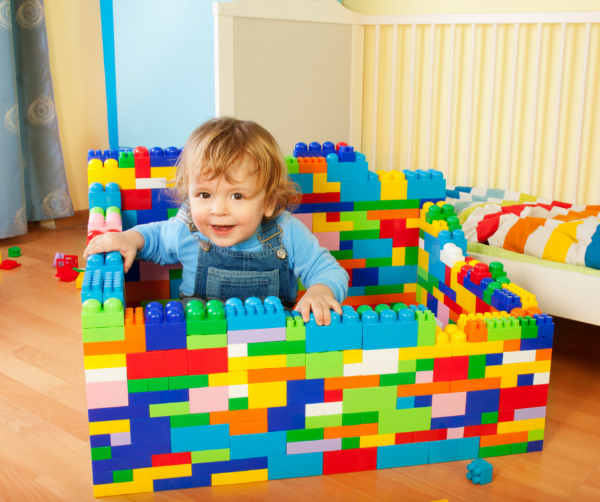 10 Tips for Selling Your Home With Small Children! Now, go back through and store or box up whatever you can live without. Keep out favorite outfits and toys and store the rest. Box up extra bedding and seasonal items. Pull out enough kitchen items to get you through the coming months and store everything else. Now is also the time to put away personal photos. Consider storing bigger toys (i.e. play kitchens, trikes, etc.) in a shed or garage. Prospective home buyers will mind a few boxes in the garage much less than extra belongings in the home. Remove anything too cartoonish or bright. A hot pink "princess" room will be difficult to imagine as a home office, so you may want to paint walls a more neutral color. Remove huge cartoon decals or paint over murals. And check for stickers! My little ones had a penchant for placing stickers everywhere. (Goo Gone is a wonder for this!) Store fridge magnets and photos. Simplify the rest with a daily routine. You don’t have to do a deep clean of your house every day, but there are simple routines that can make being “show ready” less stressful, because you never know which days will be home showing days! Make beds after rising. Store shampoo, soap, and bath toys in a bin under the bathroom sink and make it a habit to put them there after each bath time. Clear clutter off kitchen counters so they’re easily wiped down. Keep a drawer free to sweep small items into when you’re in a rush. Have bathroom wipes on hand for a quick once-over each day. Vacuum and run laundry daily. Put dirty dishes in the dishwasher. While this sounds like a lot, it really is much easier when your house is free of all that you just donated and stored! Consider cleaning help if you can afford it. This may be the time to pay for some weekly or bi-weekly help with deeper cleaning. Enlist a friend for on-call help with short notice showings. If your spouse isn’t available, keep a list of friends who are willing to watch children on short notice. Consider locking unused rooms. Have a half bath or guest bedroom that’s rarely used? Clean it and then lock it (Kids have this tendency to forget that they’re not supposed to use a room). Just don’t forget to unlock it when you leave the house! Have a checklist for when you need to leave the house quickly. Put dirty dishes in the dishwasher, flush all the toilets (don’t ask) and close lids, check all beds, empty the trash and diaper bins, do a quick damp mop of the kitchen floor. Whew! If you have a basket of unfolded laundry or another mess that you cannot deal with quickly, throw it in your car trunk on your way out! Let your kids pitch in. If you have all little ones like I did, they may not be much practical help, but let them do what they can. It never failed—the toddler would be in her high chair with food smeared in her hair and my little boys in the midst of a Lego explosion in the living room when we’d get a call for a showing. Even my 5-year-old could help (and understand the reasons why) toys needed to be put away quickly. Let them do what they can, and if they’re too little to help, keep them safely contained in a walker or high chair while you do a quick pickup! Set home showing hours if you need to. I had to stipulate no showings during the baby’s nap time in the afternoons or after a certain time each evening when the kids went to bed or I would have lost my mind. Knowing there was a time each day to catch up on cleaning or simply relax kept me sane! We survived and lived to tell the tale of showing our house with lots of little ones, and you can, too! Have you sold your house while raising small children? What are your tips?